Can you believe that it is only 25 more sleeps until Christmas? Christmas has definately snuck up on me this year! 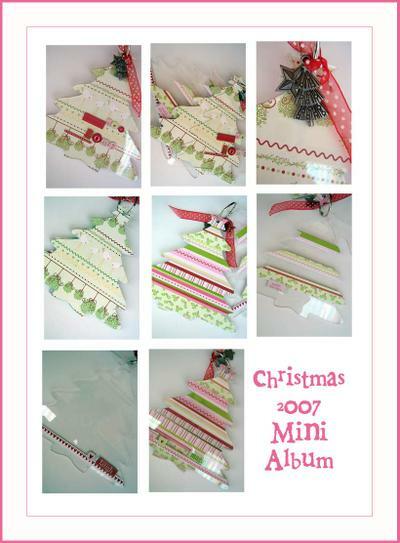 I was sent some gorgeous new Christmas papers and embellishments from Heidi Grace to play with. I used another Scrapping Clearly album to showcase this gorgeous range. You are in the chance to win this gorgeous album to go under your tree. All you have to do is comment on this post and tell me what is on your wish list for Christmas this year? You have until midnight EDST Friday 5th December 2008. These books teach colors and numbers, and are a perfect gift for the preschooler in your life. I’ve kept the shape book super simple, and the counting book is a bit more involved – either of them can be adapted to fit your taste. I used painted backgrounds and decoupaged paper to make sure they’re able to withstand little hands turning the pages over and over. 1. Gather tone on tone or solid papers in 6 colors – red, orange, yellow, green, blue and purple. 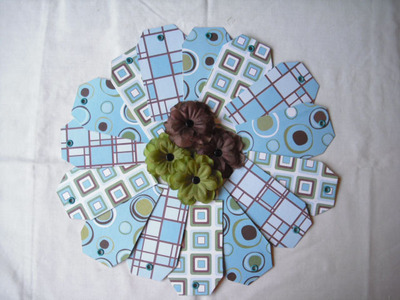 Punch a circle of each color and adhere them to the cover using decoupage medium. 2. For each color, paint the left page that solid color. Use the Ultra Shapexpress to cut out letters spelling the color from your patterned paper, and attach them over the painted page using decoupage medium. 3. Use the Ultra Shapexpress to cut a shape out of your patterned paper and attach it to the right page using decoupage medium. Some ideas of shapes to go with colors – red / heart, orange / star, yellow / sun, green / tree, blue / butterfly, purple / flower. 1. 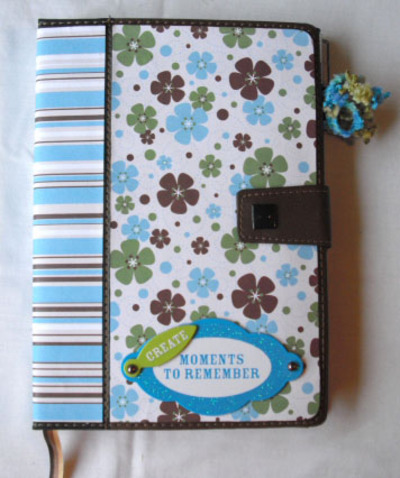 Use acrylic paint to cover the background of your book – green for grass at the bottom, and blue for the sky above. 2. Use a Round N Round circle punch on yellow paper and yellow paint to create a sun. 3. Stamp kid couple from Heidi Grace Valentine’s on the cover, and on various sheets of tone on tone or solid patterned paper. Cut out the clothes and faces of the kids and use decoupage medium to attach them over the stamped image on the album cover. 4. Stamp “I can count” using the Basic Font clear stamp set on ledger paper. Attach to the cover using decoupage medium. 5. For each interior spread, paint the background using 2 colors – one for the ground, one for the wall / sky. Use squeeze punches, usx templates and hand cutting to create scenes with different numbers of items in them. Hand draw accents with a black pen. 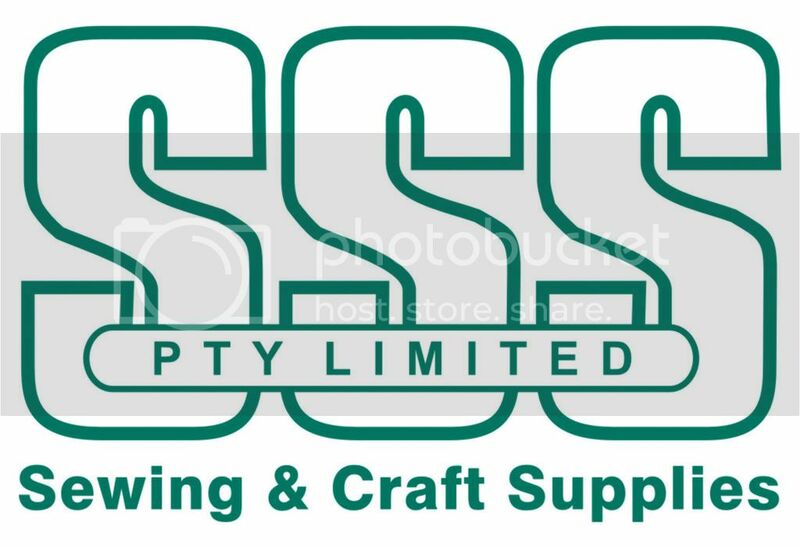 Use the letters 1 template to cut letters to put in the top corner of each spread, and stamp a description on ledger paper to go at the bottom. Use decoupage medium to adhere any patterned papers. Some ideas of items to use – 1 / bouncing ball, 2 / shooting stars, 3 / floating boats, 4 / bowls of ice cream, 5 / little houses 6 / growing flowers. Christmas Eve was a night of song that wrapped itself about you like a shawl. But it warmed more than your body. It warmed your heart...filled it, too, with melody that would last forever." ~ Bess Streeter Aldrich (1881-1954), American author, 'Song of Years'. And not only did I encounter friendly staff but all also friendly customers ! 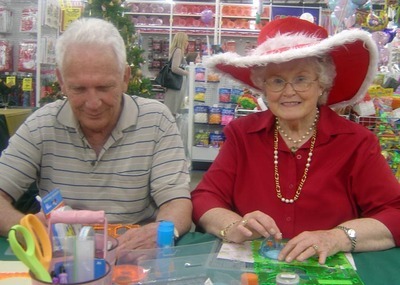 Here are a few photos of some of my customers playing with our fabulous Fiskars tools. 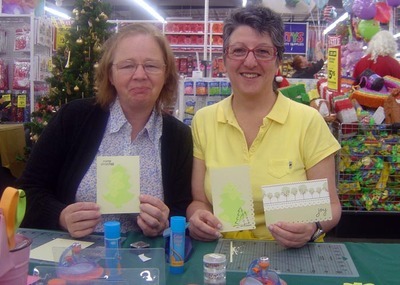 Maryanne & Josie ~ Maryanne had never used our tools before but successfully cut a Christmas Tree from the Christmas2 template with the Ultra ShapeXpress. She then used one of the bauble stamps from our 'Tis The Season' acrylic stamp set to decorate her tree. Mary has also never used our tools before and cut a circle with the Ultra ShapeXpress and then an almost perfect reindeer !! THANK YOU to everyone who stopped by my table today to say hello and have a play with my tools. 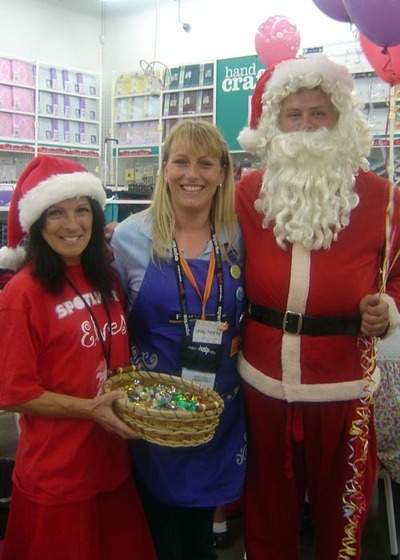 Thanks too to Heather who I have met the three times I have demonstrated at the Frankston store. Heather was so sweet and brought in the jewellery items she has made so that I could choose something for myself as a gift from her. It really made my day ! Just a couple more days before the November challenge is finished and we thought we'd show you another entry that has blown us away. 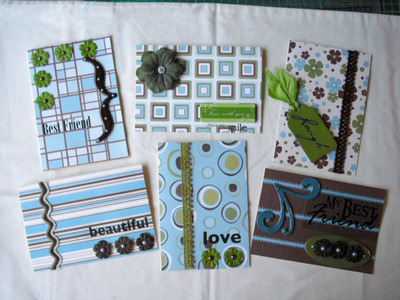 Kelly Muir has created a LO, covered a diary, created cards, tags and still has more left over! Kelly you've done a great job, thanks for entering. 1.) Print out a monthly calendar onto white cardstock (I created mine in Photoshop). Mount onto patterned paper and stitch the edges with a sewing machine. 2.) Punch out shapes from patterned paper and adhere onto monthly page. Embelish with Cloud 9 rain dots. 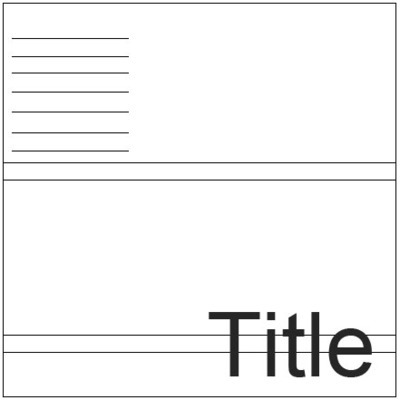 Add letter stickers for month title. 3.) Trim a piece of patterned paper for the cover of the calendar. 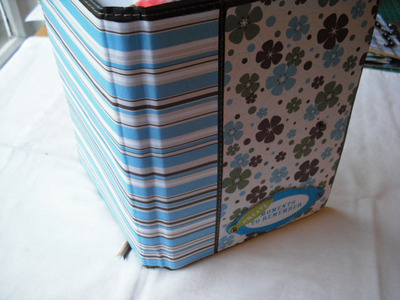 Trim a strip of patterned paper and adhere it to the cover. Adhere two strips of black cardstock and stitch together with sewing machine. Punch four scalloped squares with Square-a-licious squeeze punch and patterned paper, then adhere to the front of the cover. Add number stickers. Punch word bubble using He Said She Said squeeze punch. Add rub-ons and rain dots, then adhere to the cover of the calendar. The joy of brightening other lives, bearing each others' burdens, easing other's loads and supplanting empty hearts and lives with generous gifts becomes for us the magic of Christmas." 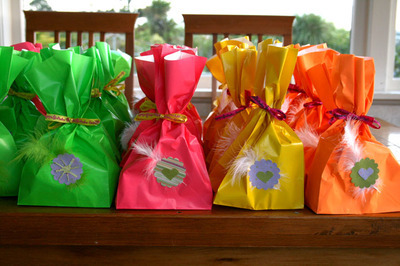 Thought I'd show you some goodie bags I made for my twins 5th birthday party on Sunday. I brought the paper bags themselves from The Warehouse here in NZ, then decorated with Heidi Grace paper (using Fiskars tools to punch out! ), then glued it on. 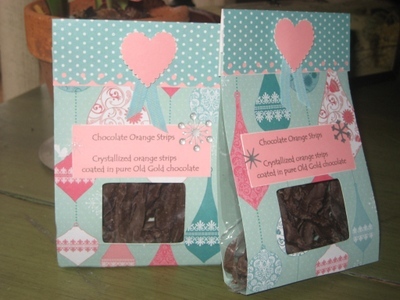 I had to make a few of them, so this was a really quick and easy way to 'spruce up' the plain bags. Have you seen the gorgeous Christine Re paper insert in this month's Better Homes and Gardens Magazine? 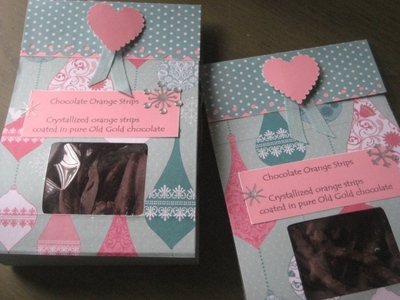 Well here at Head Office in Victoria ....Phillipa Godinho....affectionately known as Pip......couldn't resist having a play with some this week to house her "homemade" Chocolate Orange Strips......combining the gorgeous paper with the wonderful FISKARS TOOLS at her disposal. Pip does some wonderful papercrafting and she also loves to cook! She says that she doesn't do anything that great.....I would beg to differ on that one Pip.......What do you guys think? After seeing these creative gift bags I asked Pip if we could share them on here with you all as I'm sure you'll agree they will make lovely Christmas Gifts! Feel free to leave a comment to Pip in the comments section below! 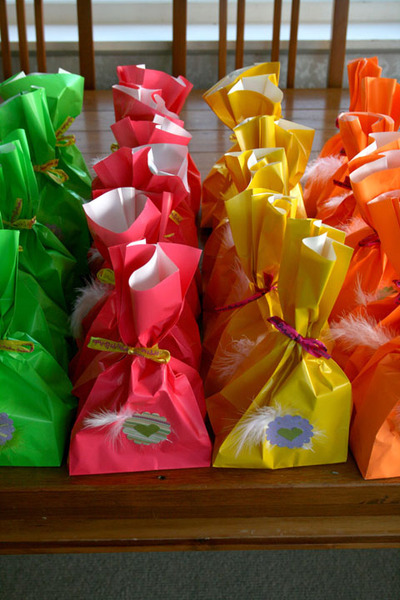 I just love these "handmade gift bags".....think I might try some now....thanks for the Inspiration Pip! and cut it into three 4" x 12" strips. folded, this will create a flat bottom for the package. (4) I used the Windows Shape Template to cut a rectangular window 0.5"
stapled them into the package right at the top. it over the top of the cello bag and bottom package. top of the package, as shown.